The first compilation of non-album Who songs released in the USA was Decca's ill-planned "Magic Bus - The Who on Tour," meant to greedily capitalize on the band's extensive and fan-winning concert appearances across the states. That poor 1968 album's title gave the false impression that it was recorded live, the tracks were mastered horribly and the cover art was atrocious. It included various B sides and studio cuts not good enough to be put on their official albums and was nothing more than a hastily packaged rip off created by their record label. Plus it was assembled without the group's knowledge or permission, making their justifiable mistrust of the cigar-chomping company big wigs grow even larger. But, at last, in 1971 we avid followers of all things Who-related were pleased to see "Meaty, Beaty, Big and Bouncy" hit the shelves. Not only was the enticing photo on the sleeve clever and witty in typical Who fashion, but finally we Americans could freely indulge in some of the hard-to-find British singles that we had only heard about. 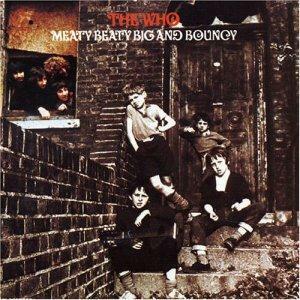 Pete Townsend even called it (at the time) the "best Who album ever" and, in many ways, he wasn't far off the mark. The LP was never far from my turntable for years on end. And for decades, until 1996 when MCA put out the excellent, 20-song "My Generation - The very best of the Who," this was the finest collection of their early material to be found. However, the latter CD is by far more comprehensive and complete (not to mention chronologically correct) so, for the proto-prog newbie that is just discovering the wonders of the Who, I recommend getting that one instead of "Meaty, Beaty, Big and Bouncy" (unless one wants to spring for the box set of "30 years of Maximum R&B"). The only songs on here that aren't on the '96 MCA release are "The Kids are Alright" and "A Legal Matter" (both respectable ditties) but the inclusion of much of the band's stronger material from "Who's Next," "Quadrophenia" and their later albums more than makes up for their being left off.